Force Free and Etouch are gentle training methods using the ecollar. Marc Goldberg and Martin Deeley are the inventors of the new method of training. These methods are gentle and get results. Thank you for visiting Pup to Dog, where family dogs get a good start. Pup to Dog is located in the Westlake Hills area near Austin, Texas. We also serve Bee Caves and Lakeway areas. Graduating at the top of her class, Marlenia Richardson is a certified dog trainer with areas of study that include the following-obedience training, class management, and kennel management. 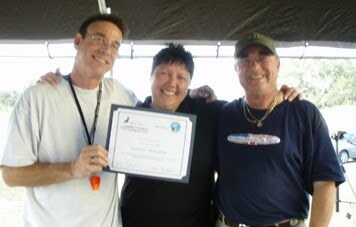 Marlenia has been training dogs for about 20 years and in the business for around 8 years now. She has shown in dachshunds in AKC obedience, bred dachshunds and currently is training seizure assistance dogs. Marlenia is a Gifted Animal Placement Canine Diagnostician Level I (GAP CDL-I #1640)-helping to find working dogs for law enforcement and service dog work. Her professional organization is the International Association of Canine Professionals (#2732). She has studied under Wayne Booth, Martin Deeley (the United Kingdom’s Gun Dog Trainer of 2007) and Marc Goldberg (IACP President). Marlenia has also taken seminars from Cesar Milan, Sue Sternberg and Temple Grandin Ph. D.
Everyone in the family helps out. Her husband George is the son of a 5th generation Texas rancher and has extensive experience in various animal breeds including dogs. Her two children frequently work with her as distractions or socializing dogs. She currently has and five dogs (three mix breeds and two purebred). Marlenia and her family will tell you that one of best things about being a dog trainer is all that you don't need to own the over 175 breeds recognized by the AKC (plus the mixed breed dogs), but you can train them and still get the pleasure of living with all different types of dogs. Pup to Dog is a participant in the Amazon Services LLC Associates Program, an affiliate advertising program designed to provide a means for sites to earn advertising fees by advertising and linking to amazon.com.